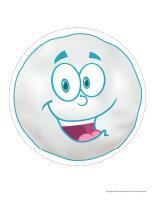 Stickers, activity sheets, creative recipes, puppet and a lot more snowy fun! 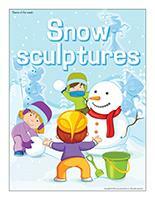 (Open thematic poster-Snow sculptures) Print, laminate, and decorate the walls of your daycare with all kinds of posters. 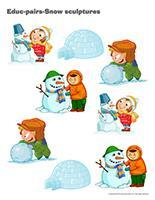 (Open stickers-Snow sculptures) Print the illustrations on adhesive paper to create a variety of homemade stickers. (Open educa-theme-Snow sculptures) Print and laminate. Use the different illustrations to decorate a corner of your daycare and present the theme to your group (and their parents). 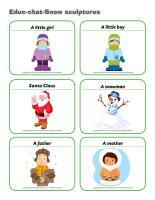 (Open educa-decorate-Snow sculptures) Print, laminate, and cut out the various items. Use them to decorate your daycare and set the mood for the theme. 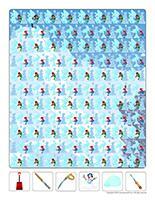 (Open transition games-Snow sculptures) Print. Let children decorate the items. Cut them out and use them to form a garland that can be hung within your daycare or near your daycare entrance. This special tool was created in response to a special request. (Open Thank you for drying your child's snowsuit and mittens) Print, laminate, and display in your cloakroom or near your daycare entrance. (Open educ-chat-Snow sculptures) Educ-chat is a game which is made up of several different illustrations which represent subjects, verbs, and objects. They can be used to help children make complete sentences and enrich their vocabulary. Print, cut out, and laminate the cards. Make three different piles (subjects, verbs, and objects). Ask children to pick three cards, one from each pile. Have them "read" the sentence. The sentences will sometimes be quite silly but you are sure to have fun. You may also choose to place the cards yourself and have children "read" the sentences. 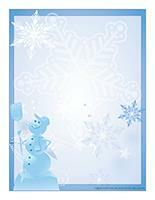 (Open Poni discovers and presents-Winter) Print and laminate the cards. Cut them out. Use your Poni puppet or another puppet children are familiar with to present the pictures to your group. Display pictures that represent different types of sculptures on the walls of your daycare (snow, sand, clay, porcelain, etc.). Use them to spark a conversation with your group. (Open picture game-Snow sculptures) Use the pictures to decorate your daycare or to spark a conversation with your group. Print, laminate, and store the pictures in a Ziploc bag or in your thematic bin. 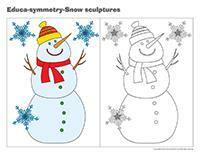 (Open activity sheets-Snow sculptures) Print and follow instructions. (Open writing activities-S like sculpture) Print for each child or laminate for use with a dry-erase marker. (Open stationery-Snow sculptures) Print. Use the stationery to communicate with parents, in your writing corner, or to identify your thematic bins. Offer only blue, white, and grey blocks. Use cotton batting to represent a carpet of snow. Children will love playing on it. Bubble wrap can also be used to cover the floor and represent ice. Deposit a container filled with salt or sugar in your area and let children play in it with small toy cars. A few figurines can become skiers or snowboarders. Decorate your area with pictures of snowmobiles, skiers, and igloos. Blue, white, and grey construction paper, tissue paper, etc. Salt that can be glued on dark paper to create designs. Chalk that can be used to draw on dark paper. Cotton balls that can be used to make a collage. Use white glue to draw snowflake shapes on waxed paper. Let dry, and gently remove and hang your beautiful snowflakes. Colourful ice cubes that can be used for painting. Miniature marshmallows that can be used to create winter scenes. White paper for making paper snowflakes. Pictures of winter clothing items that can be cut to create a mobile. White poster paint that can be used to paint on dark paper. All kinds of winter clothing items: mittens, wool socks, etc. A large pot that can be used to prepare pretend soup. Pots and cups for pretend hot chocolate. Decorate your area with winter scenes. You can even make a pretend window complete with an original winter scene. Make your own cardboard fireplace and add a few logs. Winter memory game using the educatall picture game. White, blue and grey modeling dough... Add glitter. Association game involving winter sports (ex. a skate with a picture of a child skating). Sugar cubes that can be used to build igloos. Miniature marshmallows for building snowbanks. Stimulation bottles filled with items related to winter. Picture books filled with beautiful winter illustrations. Photo albums filled with pictures of the children in your group playing in the snow. Blue and white Christmas lights to create a magical reading corner. Puppets and stuffed animals (polar animals, snowmen, etc.). A snowball fight (crumpled pieces of paper). Water table: add blue food coloring to the water. Container filled with sugar or salt. Hide tiny white objects in it or add pinecones, pine tree branches, etc. Real snow with mittens and gloves children can wear to manipulate it. Container filled with ice. If it's cold enough outside, simply fill a container with water and leave it outside overnight. Children will love to make figurines skate across the ice. Fill a container with cotton balls. Fill a large dish with whipped cream for a tasty bin. Fill a container with powdered potatoes. Use magnifying glasses to observe snowflakes. Catch snowflakes on a piece of dark construction paper. Melt ice and freeze water. Use spray bottles filled with water and food coloring or old marker felts to paint on snow. Use different types of thermometers to observe temperature changes. Have children taste a variety of white food items: sugar, salt, icing sugar, flour, etc..
Bake a white cake and let children spread vanilla frosting on it. Serve a vanilla ice cream cone to each child. Color combinations. What happens when you add white to other colors? What happens when you combine flour and water? Use mashed potatoes to make different sculptures. 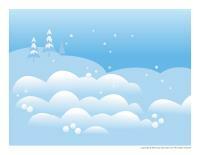 Open scene-Snow day) Print, laminate, and cut out the different items on the second page. Encourage children to use them to decorate the scene. (Open sequential story-Snow) Print and laminate the story. Invite children to place the illustrations in the correct order. (Open transition games-Snow sculptures) Print, laminate, and secure the illustrations on the floor of your daycare to create a path leading to areas frequently visited by children throughout the day. The path can lead to the bathroom, the cloakroom, etc. If you prefer, use the illustrations to delimit various areas. (Open lacing-Snow sculptures) Print, trace the shapes on heavy cardboard, and cut them out. Punch holes all the way around each model using a hole-punch. Children will enjoy lacing the shapes with a shoelace or a piece of string. Use empty tissue boxes or paper bags filled with newspaper or other recycled materials to build forts and igloos. Divide your group into teams of two children. One child from each team is the sculptor. He/she moves the other child's arms, legs, neck, etc. as he wishes to create a "sculpture". After a few minutes have children reverse the roles. Instead of making simple snowmen with your group, encourage them to sculpt a variety of animals and characters. You can also choose to press snow on a wall or tree to create a sculpture. 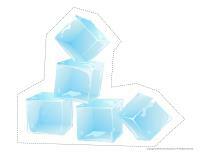 Fill several empty milk cartons with water and set them outside or in a freezer until they are completely frozen. Remove the blocks of ice from the cartons and encourage children to pile them one on top of the other to create a variety of sculptures. One child plays the role of a snowman. The other children are all polar animals. The snowman tries to catch the polar animals. When he/she touches a polar animal, the polar animal must remain perfectly still, like an ice sculpture. When all the polar animals are frozen, the first child who was touched becomes the snowman for the next round. Fill several yogurt and applesauce containers with water and add a few drops of food coloring to each one. Deposit them in the freezer or leave them outside until they are completely frozen. Empty the containers outside and use the colourful ice blocks for various constructions. With your group, lie down in the snow and move your arms and legs up and down. Help children stand up so they don't walk on their snow angel. They will love to admire the angels that have magically appeared in the snow. This activity is great for a cold and windy day. Blow soap bubbles outside, but don't let them fly away. Instead, try to catch them on a piece of construction paper so that several bubbles stick together. As the bubbles freeze, observe the formation of ice crystals with your group. If the bubbles last long enough, they will become a ball of crystals. Build a snowman or stack several blocks of snow in your yard. Paint your sculptures using spray bottles filled with a mixture of water and powdered paint. If you do not have powdered paint on hand, you may also use poster paint. Have children wear old mittens for this activity. 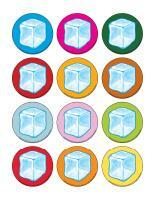 (Open educ-colors-Snow sculptures) Print and laminate for durable, eco-friendly use. If you prefer, print a copy for each child. Children must associate each snowman to the shovel of the corresponding color by drawing a line with a crayon of the same color (if desired). 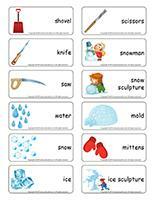 (Open educ-pairs-Snow sculptures) Print. Children must draw a line between identical illustrations or color them using the same color. For durable, eco-friendly use, laminate for use with dry-erase markers. (Open educ-intruder-Snow sculptures) Print and laminate. Children must identify the six (6) intruders. (Open educa-symmetry-Snow sculptures) Print. Children must color the bottom picture (black and white) to make it look exactly like the top picture (in color). (Open game-Snow) Print. Children must associate each picture to the correct activity. 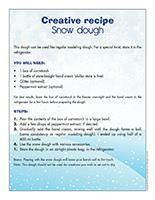 (Open creative recipe-Snow dough) Print. This dough can be used like regular modeling dough. For a special twist, store it in the refrigerator. For best results, leave the box of cornstarch in the freezer overnight and the hand cream in the refrigerator for a few hours before preparing the dough. Pour the contents of the box of cornstarch in a large bowl. Add a few drops of peppermint extract, if desired. Gradually add the hand cream, mixing well until the dough forms a ball (same consistency as regular modeling dough). I ended up using half of a 600 ml bottle. Use the snow dough with various accessories. Store the dough in an airtight plastic bag, in the refrigerator. Bonus: Playing with the snow dough will make your hands soft to the touch. Note: This dough should not be used for creations you wish to set out to dry. 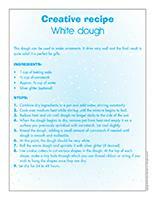 (Open creative recipe-White dough) Print. This dough can be used to make ornaments. It dries very well and the final result is quite solid! It is perfect for gifts. Combine dry ingredients in a pot and add water, stirring constantly. Cook over medium heat while stirring until the mixture begins to boil. Reduce heat and stir until dough no longer sticks to the side of the pot. When the dough begins to dry, remove pot from heat and empty it on a surface you previously sprinkled with cornstarch. Let cool slightly. Knead the dough, adding a small amount of cornstarch if needed until dough is smooth and malleable. At this point, the dough should be very white. Roll the warm dough and sprinkle it with silver glitter (if desired). Use cookie cutters to cut various shapes in the dough. At the top of each shape, make a tiny hole through which you can thread ribbon or string if you wish to hang the shapes once they are dry. Let dry for 24 to 48 hours. Let children manipulate white mousse (whipped cream or shaving cream). Adapt this activity to the ages of the children in your group. Fill a large container with clean snow and invite children to build a snow castle. Children will quickly realize that snow melts very quickly and becomes water. When the snow is completely melted, fill an aluminum pie plate with water (melted snow) and deposit it outside. Children will be impressed to see the water turns into ice. Mix one cup of water with one cup of cornstarch. The mixture is ready when it can easily be released from the container's edges. The mixture appears to be liquid, but if you hit it, it will not splatter. The mixture is liquid when it is not under pressure and solid when we add pressure to it. Give a small handful of the mixture to each child and suggest they form a ball with the magic snow. Children will observe that the ball keeps its shape as long as they press on it, but as soon as they stop manipulating it, it becomes liquid. If this activity is done indoors, be sure to set a plastic tablecloth on your table and have children wear their paint shirt. Cornstarch does not stain. Simply brush children's clothing items at the end of the activity. 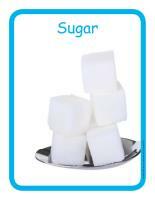 (Open educ-poster-Sugar) Print and laminate the cards to present the food item of the week to your group. The cards will help them discover different forms of this everyday food item. Display them in your kitchen area or next to the table where children eat. Give each child a bowl containing powdered potatoes. Let children add a small amount of water to their bowl. They will obtain a more or less thick preparation that is fun to play with. Let them use the mixture to create a variety of shapes. This activity is perfect for little ones since the mixture is non-toxic. Beat egg whites until soft peaks form and make meringue. Let children taste the meringue at snack time. (Open puppets-Snow sculptures) Print the puppet models on heavy cardboard. Invite children to cut them out and decorate them with various materials. Attach a Popsicle stick to the back of each model to create a puppet. (Open models-Snow sculptures) Print. Use the models for crafts and activities related to the theme. 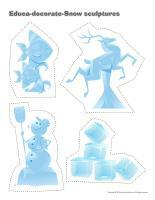 (Open stencils-Snow sculptures) Print and cut out the various stencils. Children can use them to trace or paint items related to the theme. You can stick the stencils on a large white paper banner and encourage children to splash paint on them using a toothbrush. Wrap a variety of recycled materials with aluminum paper and use them to create different sculptures with your group. Collect round objects of different sizes (the top of a garbage can, a plate, etc.). Give each child a large piece of paper and encourage them to trace three circles, with the largest one on the bottom and the smallest one on top. Let children decorate their giant snowman as they wish. (Open model-snowman silhouette) Print a snowman for each child. Provide miniature marshmallows and glue. 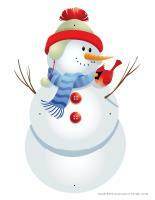 Encourage children to stick marshmallows all over their snowman shape. (Open model-snowman silhouette) Print a snowman for each child. Prepare popcorn. Have children dip the popcorn in corn syrup and then press it on their snowman shape until it is completely full. Set aside to dry before hanging with fishing wire. (Open craft-snowflake) Print and cut out. Let children glue cotton balls all over their snowflake. Encourage children to use a glue stick to draw a winter scene on black construction paper. When they are done, sprinkle flour over their drawing. Shake off any excess flour and admire the winter scene. 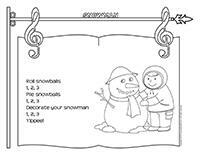 (Open coloring pages theme-Snow sculptures) Print for each child. 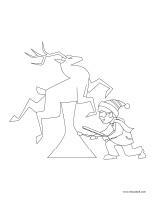 (Open I am learning to draw-A snow sculpture) Print and laminate the model sheet. Encourage children to practice their drawing technique on the model sheet. When they are ready, they may try drawing on their own.